(Updated October 10, 5 a.m. EDT) -- The Port of Charleston reopened this morning to all cruise and cargo traffic. (Updated October 9, a.m. EDT) -- Jacksonville Cruise Port reopened this morning to cruise traffic. The Port of Charleston remains closed but is expected to reopen Monday morning. (Updated October 8, 1 p.m. EDT) -- Port Canaveral reopened this afternoon after being cleared by the U.S. Coast Guard. (Updated October 8, 10 a.m. EDT) -- The port of Charleston remains closed today; according to the port website, it's expected to reopen Monday. Port Canaveral is expected to reopen this afternoon; it's awaiting approval from the U.S. Coast Guard. The port of Jacksonville remains closed pending a damage assessment. (Updated October 7, 4:49 p.m. EDT) -- The port of Charleston will be closed October 7 to 8; there's a chance it also may be closed through Sunday. Port Everglades, as well as the ports of Miami and Palm Beach, all have reopened. Norwegian, Carnival and Royal Caribbean all have ships scheduled to depart from Miami tonight. Port Canaveral remains closed. (Updated October 6, 1:37 p.m. EDT) -- Six U.S. cruise ports have shut down as a result of the imminent threat of Hurricane Matthew, which is expected to approach Florida's east coast Thursday evening. Port Miami, Port Everglades, Port Canaveral, the port of Jacksonville, the port of Palm Beach and the port of Key West have closed to all marine traffic until further notice. A number of cruise ship itineraries have been affected. The ports are operating under the U.S. Coast Guard's Port Condition Zulu, a full lockdown which prevents all vessels from entering, leaving and remaining in port. It's issued when gale-force hurricane winds are expected within 12 hours. The port of Charleston shut down Wednesday, but has since reopened due to the storm's latest projected path. Hurricane Matthew has caused widespread devastation in Haiti and claimed 330 lives so far. It is currently 80 miles SE of Cape Canaveral and is classified as category 3 with maximum sustained winds of 120 mph. "This is a serious storm, and the protection of people and property is our primary concern," Port Canaveral CEO John Murray said in a statement. "We expect high winds and storm surge throughout the port and have urged the Port community to prepare their facilities so business can resume as quickly as possible after the storm." It is not clear whether the ports will remain closed. If they do, the ships will either be forced to stay at sea or head to another port farther up the coast. The cruise ports advise booked passengers to contact the cruise lines for itinerary changes caused by port closures. Cruise Critic is in contact with the lines and cruise ports, and will continue to update this story as more information becomes available. See below for the most up-to-date status of cruise ports in areas that will or could be affected. 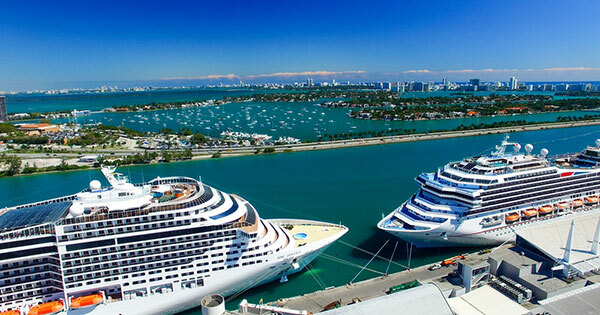 Miami Cruise Port: Port Miami is closed to all vessel traffic until further notice. The Port Miami Tunnel as well as drawbridges in the area also will be closed. Norwegian Sky, Carnival Fantasy, Carnival Sensation, Enchantment of the Seas and Empress of the Seas are due in port Friday. Fort Lauderdale (Port Everglades): Port Everglades is closed to all vessel traffic until further notice. Drawbridges in the area also will be closed; a full lockdown is anticipated Thursday morning. Oasis of the Seas is the next ship scheduled to arrive in Fort Lauderdale, on Saturday, October 8. Port Canaveral (Orlando): Port Canaveral CEO John Murray has issued an evacuation order for all landside port operations -- the first time it has done so in 14 years. Additionally, the U.S. Coast Guard has advised that Canaveral Harbor will close Wednesday afternoon. According to a statement released by the port, the Captain of the Port has ordered a stop to all vessel traffic -- including cruise ships -- in the harbor until after the storm passes and the order is lifted. Carnival Victory, which was originally scheduled to return to Port Canaveral tomorrow will remain at sea until the port reopens. Port of Palm Beach The Port of Palm Beach closed yesterday at 6 p.m. EDT to all vessel traffic and will remain closed until further notice. It serves just one line Bahamas Paradise Cruise Line, which operates one ship, Grand Celebration every other day to Grand Bahama in the Bahamas. The ship is due in tomorrow, but it is not clear yet whether it will be diverted, canceled or stay at sea. Jacksonville Cruise Port Jaxport is closed to all vessel traffic until further notice. Carnival Elation could be delayed returning to Jacksonville, according to a spokesman for the line. It is schedule to return Saturday. Charleston Cruise Port: The port has altered its operating schedule, restricting cargo shipments before closing for the remainder of the week. Carnival Ecstasy, which was originally scheduled to return to Charleston on Saturday, will remain at sea until the port reopens. Norfolk Cruise Port: The port is operating as normal. The next ships scheduled to arrive in Norfolk are Silver Explorer (tomorrow) and Azamara Quest (October 13). Baltimore Cruise Port: The port is operating as normal. The next ships scheduled to arrive in Baltimore are Grandeur of the Seas (Saturday) and Carnival Pride (Sunday). Bayonne (Cape Liberty): The port is operating as normal. The next ship scheduled to arrive in Bayonne is Anthem of the Seas on Thursday. New York (Manhattan): The port is operating as normal. The next ships scheduled to arrive in Manhattan are Disney Magic (Friday,), Norwegian Gem (Saturday), Carnival Sunshine (Saturday), Aidaluna (Saturday) and Aidadiva (Saturday). New York (Brooklyn, Red Hook): The port is operating as normal. The next ships scheduled to arrive in Brooklyn are LeBoreal (tomorrow) and Regal Princess (Saturday).